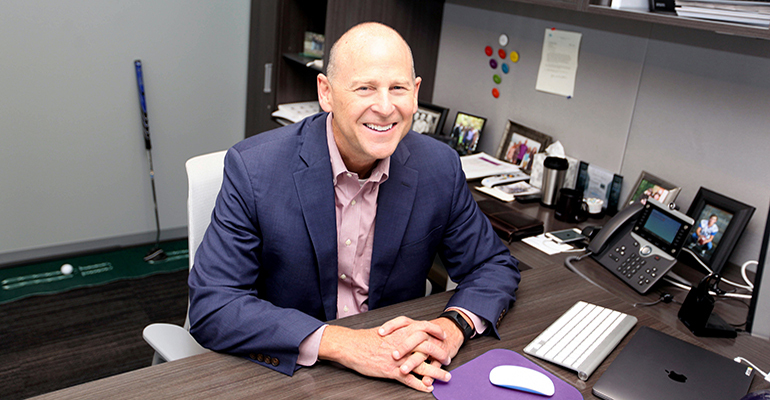 Ensono's Jeff VonDeylen has learned that empathy is key to surviving change. Wish you could press “pause” for just a few minutes to catch your breath, and your balance, before diving back into the madcap business of managing the world’s digital transformation? Sorry, change isn’t going to stop coming for us. So many seismic shifts are happening in business and technology right now that a state of upheaval is beginning to feel almost normal — and the risk of feeling overwhelmed or disconnected is sky-high. So what’s the answer? Jeff VonDeylen, CEO of Ensono, says there’s one characteristic essential to surviving disruption, and what it is it might surprise you: empathy. VonDeylen, our 2018 recipient of the Channel Futures MSP 501 Executive of the Year Award, has learned that understanding the moods and motivations of his team is critical to successfully leading an organization. That goes double in times of great change, which almost always breed apprehension. He should know: In 2016, VonDeylen took the helm at Ensono, which had just spun off from parent company and database marketing provider Axciom. He came in with a vision of a new kind of IT services company, one he wanted to help create. That vision, it turns out, wasn’t quite as solid as he hoped. In 2015, what was then Axciom IT existed to provide IT infrastructure management to one of the largest commercial databases of consumer data in the world. When that division broke free, rebranding itself as Ensono in January 2016, it brought with it a deep understanding of mainframe support and a solid client roster. It also had ambitions to become a big player in marketing and cloud technologies. As you can imagine, the company’s expertise and its vision didn’t quite go hand in hand. VonDeylen found himself leading a company with an identity in flux during a time of upheaval in the IT industry. What’s more, there was a general downtrodden spirit among Ensono’s people, who for years had felt undervalued at Axciom and excluded from the digital marketing company’s grand vision of the future. Perhaps because it was so eager to harness that particular brand of energy, which seems to buoy so many cloud-based digital services providers like Axciom, Ensono was, in the beginning, focused on modernization and cloud enablement. Its deep expertise in legacy applications seemed like old news. Weren’t clients just going to migrate off of mainframe servers next week, anyway? That was a big lesson in business empathy. Ensono took a step back, listened to the market and tried to understand what it needed. Today, VonDeylen says the company has married its mainframe and modernization expertise to create a truly differentiated space for itself. There are some young, exciting companies out there that are only thinking about public cloud. As great as they are, those companies are not Ensono’s target clients. Rather, VonDeylen and his team want the long-established organizations with a set of applications and infrastructure developed over the course of decades. Such systems can be messy and laden with technical debt, but they’re the perfect blend of critical applications that have to stay the same and opportunities for new development efforts for Ensono. Such clients are its sweet spot. In the last three years, VonDeylen has overseen a series of acquisitions designed to strengthen Ensono’s hold on that target market, including buying Wipro’s Hosted Data Center Services (DCS) business in the United States, Europe and Singapore just this summer. The move nearly doubled Ensono’s size, adding 900 employees to its roster, and shot its annual revenue up to more than $550 million. In a company that large, that’s growing that quickly, maintaining employee empathy seems prohibitively challenging. It’s also never more critical. Change, he says, brings apprehension. Will my skill set still be valuable? Will there be budget for my position? Will I change teams or get a different supervisor? These worries can be exacerbated at a company like Ensono, whose rapid expansion, forward-thinking vision and global reach might feel like a dizzying ride to some. At three years old, Ensono is just starting to figure out what kind of company it wants to be. In order to do that, it has to be able to intuit what the market wants, understand what its clients are asking for and internalize the concerns of its employees — all while growing by leaps and bounds. It’s a tricky line to walk. Ensono has exactly the scale it needs right now, but VonDeylen says that’s not going to last forever. The market, the technology, will keep changing and keep growing, and he will have to keep advocating for change as needed to stay relevant. But if he can just keep that culture of empathy alive, VonDeylen is confident Ensono can get the job done. Recent attacks on MSPs have highlighted RMM vulnerabilities, reinforcing the need for a security-centric approach in MSPs foundational practices. News from Azure and Google Cloud highlight the growing capabilities around functions as a service.